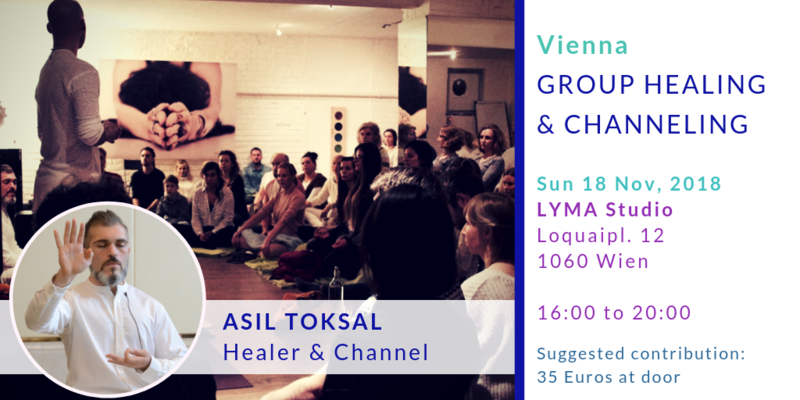 Welcome to the 3 hour group Channeling & Healing with Asil Toksal. It is a privilege to share this work for the first time in my home town, Vienna and very grateful to LYMA Studio for hosting the event. This is an invitation to a unique experience of deep healing and channeled wisdom. If this resonates with you, please join with an open heart and mind. Please read below for further information and how to prepare for this session. (There is also second date in Vienna on 25 November at the wonderful Schmida Institut, for those who wish to experience a further session with Asil, or cannot make it to this first one on 18th November at LYMA). We lovingly suggest an offering starting from 35 Euros to support Asil’s work, however please let money not be a barrier for you to experience this work. The session is a 3-4 hour immersion into high-frequency presence. During these sessions, Asil Toksal opens up to channel high-vibrational energy and angelic and archangelic beings. You may experience deep peace within, connections to other realms, healing, transmission and/or downloads of energy. You will also have the opportunity to ask direct questions to the guides. Please read carefully the information below for your self-preparation. – Please arrive on time or before time. We start at 4:30pm latest.